The trapezius muscle is connected to the neck, trunk, and shoulders. The trapezius muscle is shaped like a diamond and consists of three bundles. Its upper bundle is attached to the clavicle and its middle and lower bundles to the scapula. It aids in lowering or raising the shoulders, turning, tilting, and extending the head, as well as in pulling the shoulders back. 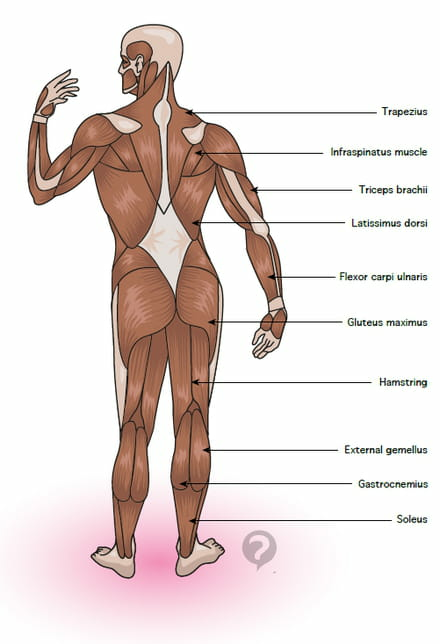 The trapezius muscle is connected to the trapezoidal nerve. This document, titled "Trapezius muscle," is available under the Creative Commons license. Any copy, reuse, or modification of the content should be sufficiently credited to CCM Health (health.ccm.net).